For the first time that I can remember, local brewery Tenaya Creek went all out to ensure that craft beer fans got a chance to whet their palates with some rare offerings. 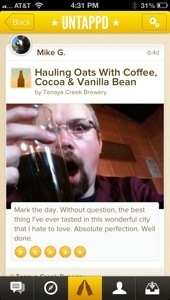 Each day, Tenaya Creek released a new beer (sometimes more), and all are worth talking about. I guess this was more of a beer cocktail, but it was delicious nonetheless! This shandy is simply a pairing of Tenaya Creek Hefeweizen and lemonade, and it is quite refreshing and delicious. Just imagine drinking a slightly carbonated, slightly wheaty glass of lemonade on one of our hot Vegas days. This fine drink turned out to be the favorite of many of the folks that I talked with. Take Tenaya Creek’s already flavorful pilsner, dry hop it with Citra hops, and what you get is a great beer with a strong citrus nose, followed by the crisp pilsner taste that the base beer is known for. The Citra mixed in very well, and did not overpower the always tasty pilsner. This day saw Tenaya Creek bust out the big guns with three different dry hopped varieties of Hop Ride IPA. The first, and most popular, was the Simcoe version. This one was bursting with the citrus, piney nose that the hop is known for, while adding just a balanced, complimentary amount of flavors to the taste. The next variety was El Dorado. El Dorado is known to have a watermelon, or pear like flavors, but I didn’t get much of that. What I did get were a lot of earthy flavors. I would however love to to give this one a try again, with perhaps a cleaner palate. The final variety was dry hopped with Nelson Sauvin. Nelson Sauvin can either present a very tropical flavor, or a very wine-like flavor. Thankfully, this one turned featured the former flavors. I really enjoyed the tropical nose, and the slightly tropical flavor, which only added to the fantastic bitterness of the Hop Ride. Not surprisingly, this was another popular brew. I find that in a lot of coconut beers, the coconut either overpowers, or doesn’t quite come through enough. This is one of the exceptions! The coconut is nicely balanced and cuts through the malty brown ale without ever becoming overpowering. The finish is also fantastic, leaving the toasted coconut flavor lingering on your taste buds. I love Old Jackalope, I really do. I look forward every year to its release, and I generally make sure I have a few bottles stashed away for a rainy day. So basically, in my opinion, Old Jackalope can do no wrong. When dry hopped with Simcoe, it simply makes this barley wine taste as fresh as the day it was bottled. You get a bit of citrus on the nose, but when you take your first sip, you still know you are drinking an American barley wine. I’d highly recommend this one, dry-hopped or not. I have a very simple description for this one: orange creamsicle! When you first take a big whiff of this one, you get a big bitter orange smell. The first taste yields a nice, fleshed out body, thanks to the nitro pour. As it warms, it tends to get creamier, and taste like the frozen treat mentioned above.